Bad news is good news, again? There are several canaries in the coal mine that investors should consider in concert. The backdrop is eerily similar to that of April 2000. Despite the impressive performance in the first quarter, I am positioned defensively for 2019. After the best returns for the stock market in a decade during the first quarter of this year, history suggests that there could be more good times ahead, as detailed in an article this week by Ploutos. Now investors need to ask themselves a simple question - should they party as though it was April 1999, or should they hibernate as though it was April 2000? The market is charging ahead to start the second quarter as though the party will continue. The Fed just served investors with another round of monetary largesse to ease the pain of the hangover that was starting to set in at the end of last year. I'm going to pass on this round. The initial public offering of Lyft (LYFT) reminds me of some of the very last high-flying IPOs that came to market in late 1999, as the valuations are as absurd today as they were back then, but I have far greater concerns. Perhaps we will push to new highs in the days and weeks ahead, as these highs are merely a few percentage points from here, but I am far less sanguine about the rest of this year. This market reminds me more of the 1999-2000 period than any other, and I'm not interested in gambling on which April may be the one we find ourselves in today. The flow of economic data tells me that it is more like April of 2000. If I'm wrong, then I'll continue to participate, but to a lesser degree. If I'm right, then I'll profit from my hedges and have plenty of cash to put to work at much lower prices later this year. It appears we again find ourselves in the paradox of rising prices for risk assets as the economic fundamentals continually disappoint. This is best represented by the steady decline in Citi's Economic Surprise Index over the past 15 months. Notice that from the peak of 80.0 in January 2018 to the recent low of -44.8, the S&P 500 has managed to rally back to the same level. 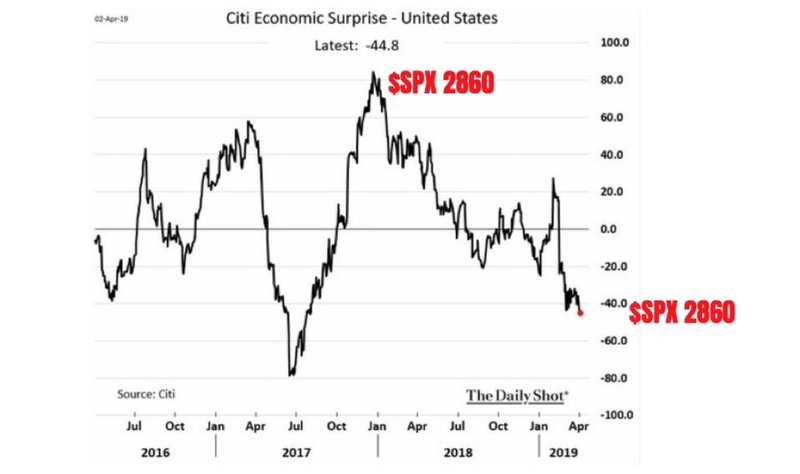 Skeptics will point to a similar decline, but a far sharper one, in April 2017, but we had the anticipation of a $1.5 trillion tax cut to awaken animal spirits in the second half of the year. That won't happen again. There is the anticipation of a trade deal with China, but that has most assuredly been priced into the market over the past several weeks. I don't see a clear path for the economic data to start surprising to the upside. Yet this is only number one of several canaries in the coal mine of this economic expansion and bull market that give me déjà vu to 2000. On its own it isn't that alarming, but when viewed in concert with the following developments, it screams wealth preservation! You will notice something very unusual in the chart below. 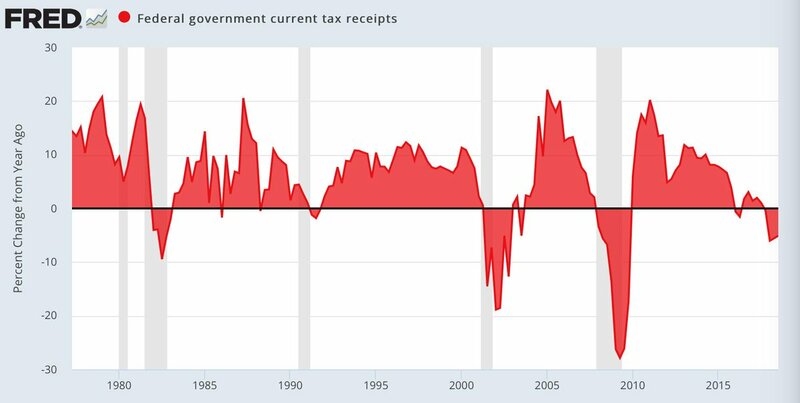 Every time there has been a substantial and prolonged year-over-year percentage decline in tax receipts for the federal government, it either coincided with or followed a recession. We are in the midst of such a decline right now, but the next recession is in front of us. The reason we are seeing this decline in tax receipts is because of the irresponsible $1.5 trillion tax cuts that were implemented in 2018. This will greatly hamper the ability of the federal government to use fiscal stimulus to battle the next economic downturn. 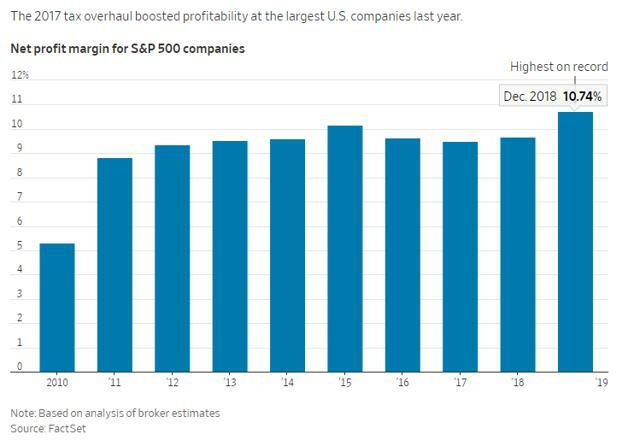 The tax cuts in 2018 primarily benefited corporations, which led to a boost in profit margins to record highs. The problem now is that margins have nowhere to go but lower as the impact of the tax cuts wanes. At the same time, wages are on the rise, and they are the largest expense item for corporations. Target just announced yesterday that it is raising its minimum wage to $13/hour, as many of its competitors have already done. 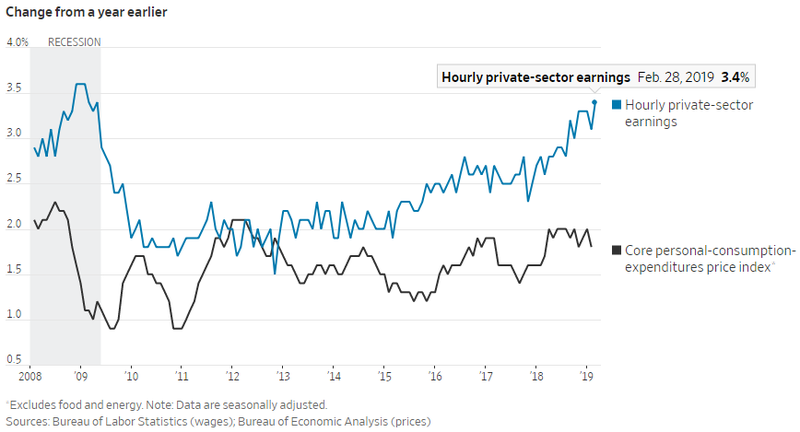 Wage increases across many industries are finally starting to be implemented, and this will reduce margins and corporate profitability. 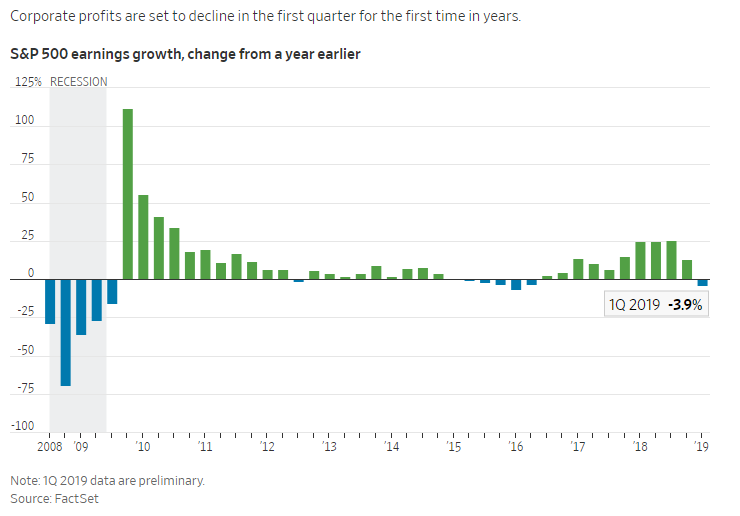 Corporate earnings are expected to decline year-over-year in the quarter just ended for the first time since 2015. This is largely being ignored, because the consensus expects we will return to growth in the second quarter and that the growth rate will increase in the quarters that follow. Bulls also point to the earnings recession that lasted several quarters during 2015 and 2016, which had minimal impact on stock market performance. The problem with this comparison is that the last earnings recession was primarily driven by a massive slump in the energy sector, as oil prices plunged from over $100/barrel to less than $30. 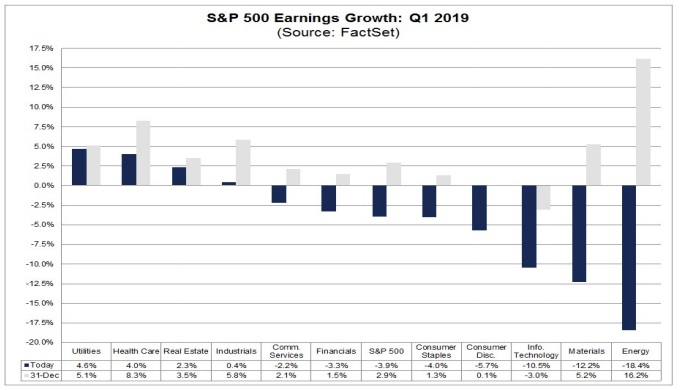 There were plenty of other sectors in the market that continued to realize earnings growth. The downturn in profits is much broader today, as can been seen below. We have record levels of corporate debt spurred on by historically low interest rates and easy lending standards. Doesn't that sound familiar to those who lived through the last financial crisis? It will most assuredly be a catalyst to the next economic and financial market downturn. My primary concern is the debt issued by the highest-risk companies that comprise the Russell 2000 Index (IWM). This segment of the market is leveraged to an unprecedented degree, and the debt far outstrips the free cash these companies generate. If interest rates rise or profits decline, then rating agencies will start to lower credit ratings and financial conditions will tighten dramatically. 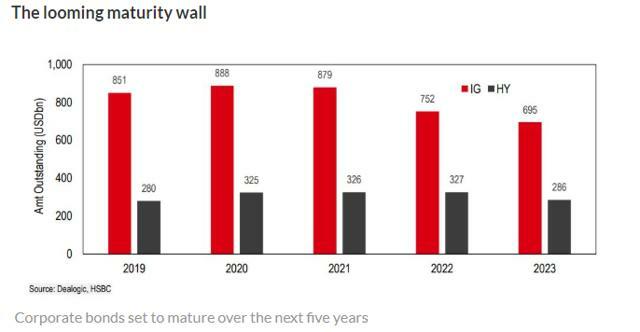 Making matters worse is that this year will be the first year we begin to see significant maturities for high-yield and investment-grade debt. 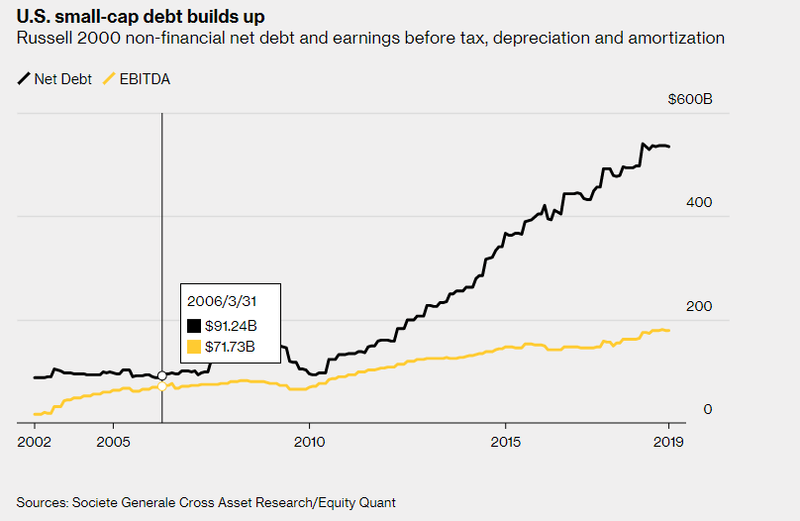 Investors should be mindful of the fact that a large percentage of investment-grade debt at the lower end of the credit quality scale is likely to be downgraded to junk status if financial conditions tighten. 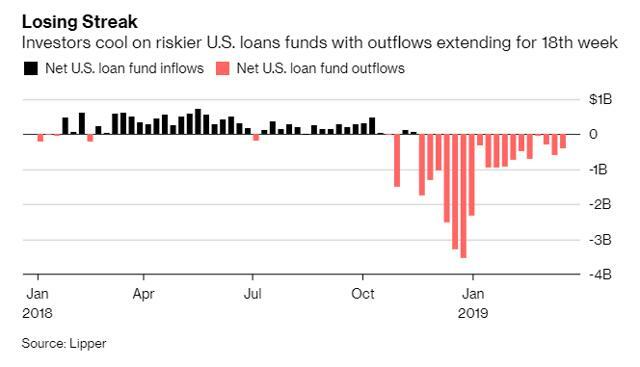 Cracks are already starting to emerge in the $1.3 trillion leveraged-loan market, as fund assets peaked last September at $175 billion, but consistent outflows have reduced holdings to $148 billion. We know two things for certain. The first is that we are in the late stage of the longest expansion on record. The second is that a recession will follow. When I look at the past three cycles, including the current one, in the chart below, one thing stands out above all others. The Fed recently indicated that it was unlikely to raise interest rates further. Investors interpreted this as extremely bullish, leading to a huge rally in the S&P 500 during the first quarter. Yet look at what happened the last two times when the Fed stopped raising short-term interest rates. Both coincided with what was a cyclical low in the unemployment rate, which is what the consensus agrees we are seeing today. Both also coincided with a stock market that was achieving a new all-time high, as we are today. The Fed's action should be a cause for concern and not celebration. This is a flock of canaries that I think requires positioning portfolios more defensively for 2019. My investment strategy dictates always maintaining some exposure to each asset class, but tactically weighting that exposure depending on technical indicators and market fundamentals. I have lowered the risk profile of my stock allocation by focusing largely on companies with lower P/E multiples and higher dividend yields. I am currently holding approximately 35% of my stock allocation in a money market. I have constructed a five-year corporate bond ladder of investment grade issues for my fixed-income allocation with a focus on companies that are strengthening their balance sheets and can weather an economic downturn. I'm holding positions in gold, silver and other commodities that I believe reduce volatility of my portfolio overall and enhance the potential for long-term returns. Lastly, I am hedging my existing stock market exposure with options strategies that will profit from a decline in the weakest performing stock market index, which is the Russell 2000. Disclosure: I am/we are long TZA BULL CALL SPREADS. I wrote this article myself, and it expresses my own opinions. I am not receiving compensation for it (other than from Seeking Alpha). I have no business relationship with any company whose stock is mentioned in this article.